In this piece for our “Time” theme, I continue my love affair with trees – specifically aspen, which are so abundant in my wee hamlet. For this piece, I had a vision of an aspen branch through the seasons. I began with winter at the top, when the branches are gnarled and bare. Then comes spring, and the delicate seedlings that produce bright green leaves. Next, summer, when the leaves darken in colour. Lastly, there is autumn – my favourite — when the golden leaves look and sound like jingling coins when the wind blows through them. This piece is a whole cloth of hand-dyed blue cotton – the skirt from a thrift shop sundress. I traced the outline of the branches and leaves directly on the fabric with a mechanical pencil before sandwiching and quilting it with black cotton thread, designed to resemble the ink of pen-and-ink drawings. 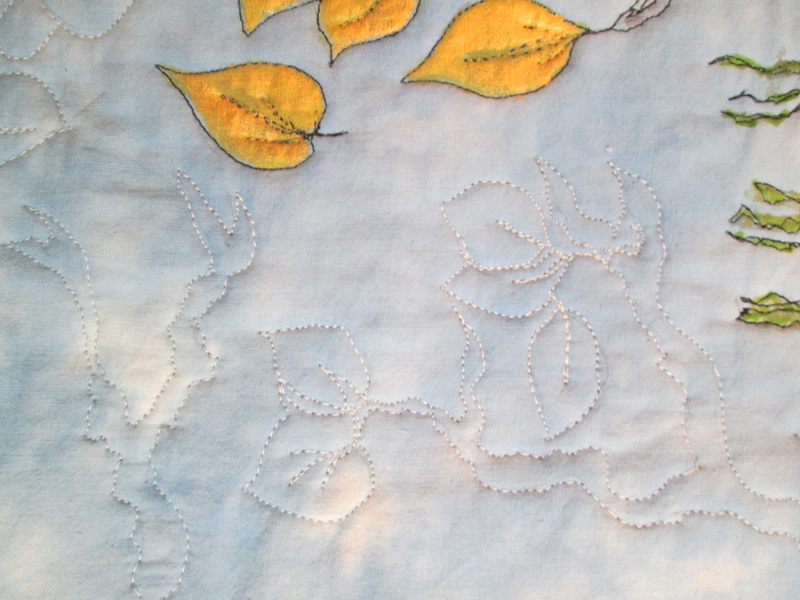 Next I lightly drew similar branches and leaves all over the background and quilted them with cotton thread that was a close match to the blue of the ‘sky’. 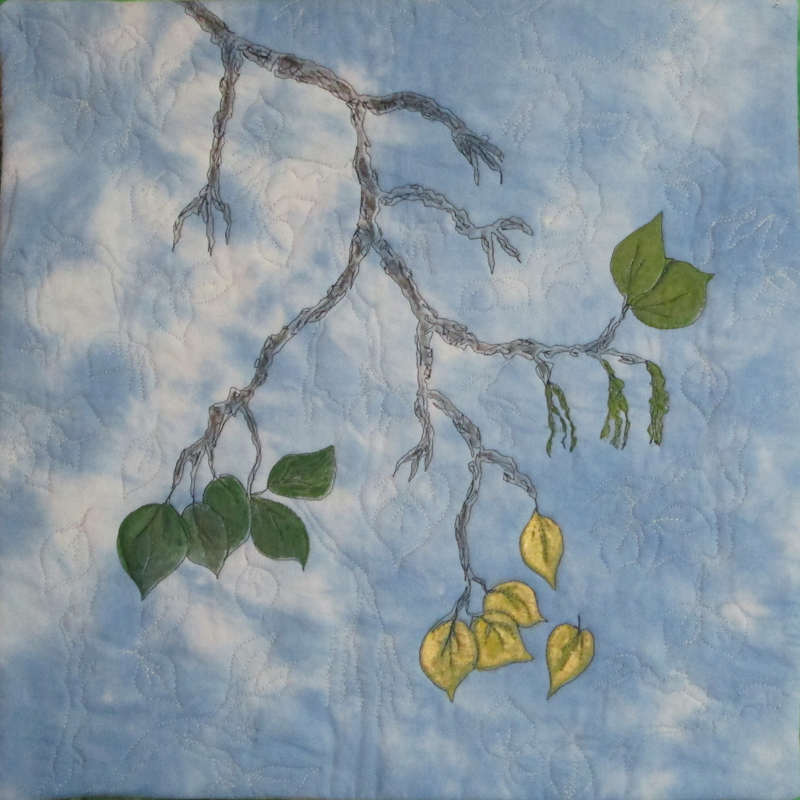 Once quilted, I painted in the leaves by mixing acrylic paint with textile medium and gently applying it directly to the fabric. Once dry, I faced the quilt with a fabric to match the backing. This is actually the second incarnation of this piece; the first time, my paint was too dilute and some of it ran irreparably against the background. I’m pleased that I managed to lighten my touch the second time ‘round, to produce a piece with which I’m well satisfied. What a great idea. It is one of my favorites. 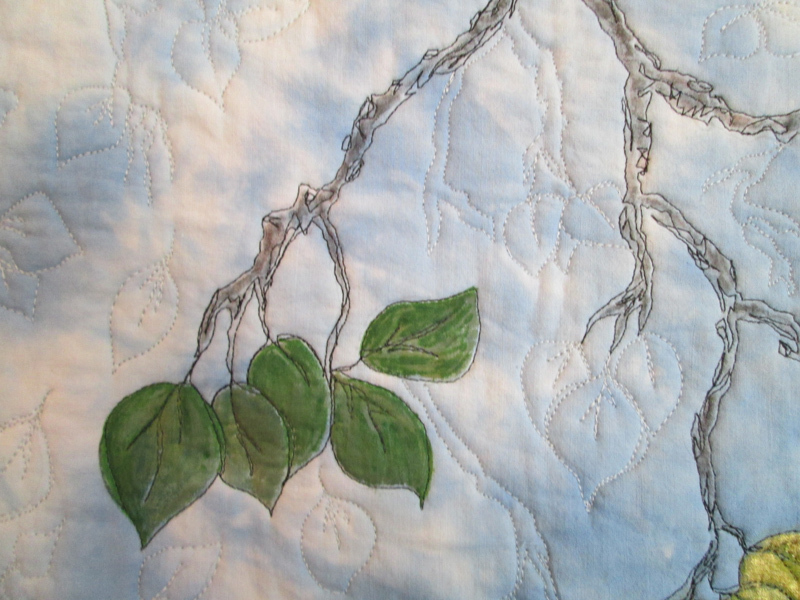 Very delicate Margaret, I like how you quilted the branches like an echo of the main subject ! Margaret, your interpretation is innovative and the simplicity truly depicts how Time changes through the seasons. Well Done.